Descending, and Riding in Groups. Beginning Saturday, March 26th and going on until Sunday, May 8th, Park Rangers at Dead Horse Ranch State Park (directions) in Cottonwood will offer guided mountain bike rides on Saturdays and ranger-led hikes on Sundays. The hikes & rides are free, however the regular entrance fees to the park will apply. Annual Passes will also be honored. “Mountain Bike Basics” will take place every Saturday afternoon at 2:00, and go until 4:00, “or when everyone gets tired”, according to Park Ranger Randy Victory. “These will be beginner trail rides on the dirt, with a little instruction on the pavement.” Victory, a certified cycling instructor, will offer everything from basic riding techniques to trail etiquette. Although the rides are oriented towards beginners, everyone is welcome to attend (minimum age is 15). “There’s always a certain amount of interaction between riders,” explains Victory. “Group rides where the beginners are supportive of each other, and more experienced riders can offer their insight are an excellent way to build skills, and have a great time doing it. The focus is on fun!” Riders will be REQUIRED to wear a helmet and complete an acknowledgment of risk form (parents must sign for riders under 18 years old). They should also bring water and make sure their bike is in good working order. Riding gloves are recommended. The rides will start at the Raptor Trailhead at the top of Roadrunner Road at the park. “Nature Walks” will start on Sunday mornings at 9:00 am, and last for 1-2 hours. The guided hikes will meander along riparian areas or stroll through the high desert trails within the park. Hikers need to bring plenty of water, sunscreen and wear appropriate clothing; sturdy shoes, a hat. Says hike leader Ranger Margie Sanchez, “You might want to bring binoculars and a camera, too. These hikes are a great opportunity for wildlife sightings and photo ops.” Most hikes start at the Quail Loop Campground – inquire at the gate for starting points. Anyone is welcome to show up for the hikes & rides at the park. The day use fee is $7.00, or an Annual Pass can be used. 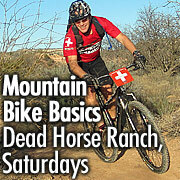 For more information, call Dead Horse Ranch State Park at 928-634-5283. You can also email Ranger Victory at rvictory@azstateparks.gov or Ranger Sanchez a msanchez@azstateparks.gov with questions.